We want the benefit of her response to a romantic evening, but not weeks of planning beforehand! But a little planning for the perfect date will be well worth the effort. If you find yourself in an unfamiliar town, do a little research on the best restaurants and the best places to visit whilst on a date. Have a few choices up your sleeve so your date can also help with the decision. She’ll feel touched that you put her first, and made some effort. You can do this while waiting for your coffee to be ready at the cafe. Make sure you take a shower, shave, and think about your appearance. If you’re using a luxury dating agency, you’ll want to look like a luxury date! Use a nice cologne too, ladies always like a gentleman who smells good. Think about other touches that will impress your date. What about hiring a chauffeured car, or even a ride on a horse and carriage? Perhaps also consider booking the best table at the restaurant; your date will love it, and be very grateful. Don’t forget to tell your date how beautiful she looks. She will have put in a lot of effort to look good for you too! So a little appreciation goes a long way. If the mood is right and you’ve done all you can to set up a romantic evening, relax and enjoy yourself. Your date will do her best to put you at ease and make the evening sparkle. So make the most of all the effort you’ve put in, and be sure to have a fantastic time. Just because your meal is over, doesn’t mean the date has finished. What about a romantic walk under the stars? A pleasant walk after a lovely meal is the perfect way to end the perfect date. Or you could share a bottle of wonderful red wine together back at your hotel, enjoying a laugh and some great conversation. 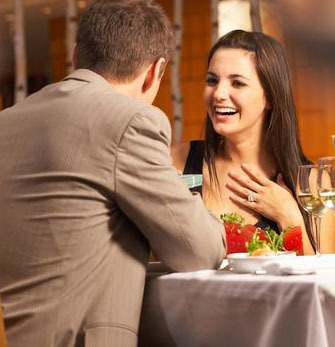 When the date finally does draw to a close, be sure to thank your date and tell her how much you enjoyed her company. Compliment her as much as you can. This will please her and remind her that you are definitely someone she’d like to meet again. (You can be sure she will be doing the same for you, to ensure a wonderfully special girlfriend experience, or GFE.) A romantic evening takes a little planning, but it will definitely be worth it. Can You Ever Really Be Friends With Your Ex Partner?